21. Which of the following services is not provided by wireless access point in 802.11 WLAN? 22. Which of the following fields in IPv4 datagram is not related to fragmentation? The multiplexer is shown in the Figure. Each frame carries 1 byte from each channel; the size of each frame, therefore, is 4 bytes, or 32 bits. Because each channel is sending 100 bytes/s and a frame carries 1 byte from each channel, the frame rate must be 100 frames per second. The bit rate is 100 × 32 = 3200 bps. 24. In a typical mobile phone system with hexagonal cells, it is forbidden to reuse a frequency band in adjacent cells. If 840 frequencies are available, how many can be used in a given cell? 25. 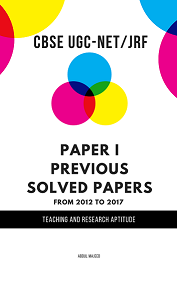 Using p=3, q=13, d=7 and e=3 in the RSA algorithm, what is the value of ciphertext for a plain text 5? p=3, q=13, d=7, e=3, M=5, C=? 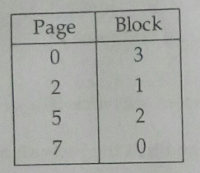 Which of the following list of virtual addresses (in decimal) will not cause any page fault if referenced by the CPU? 27. 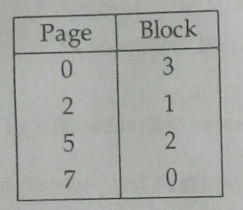 Suppose that the number of instructions executed between page faults is directly proportional to the number of page frames allocated to a program. If the available memory is doubled, the mean interval between page faults is also doubled. Further, consider that a normal instruction takes one micro second, but if a page fault occurs, it takes 2001 micro seconds. If a program takes 60 sec to run, during which time it gets 15000 page faults, how long would it take to run if twice as much memory were available? Doubling the memory, doesn’t mean that the program runs twice as fast as on the first system. Here, the performance increase is of 25%. 28. Consider a disk with 16384 bytes per track having a rotation time of 16 msec and average seek time of 40 msec. What is the time in msec to read a block of 1024 bytes from this disk? If there are 16384 bytes per track there are 1024/16384 tracks to be read for this block. If x is 0, available vector will be 0 0 0 1 1, we have a deadlock immediately. If x is 1, available vector will be 0 0 1 1 1, now, process D can run to completion. When it is finished, the available vector is 1 1 2 2 1. Now A can run to complete, the available vector then becomes 2 1 4 3 2. Then C can run and finish, return the available vector as 3 2 4 4 2. Then B can run to complete. Safe sequence D A C B.